Merchant will need to install your app in order for your payment method and settings to be shown. After the installation, user would need a page where they can configure it. We recommend using Native apps feature to provide this functionality. In any case, your payment method will be displayed in the payment settings of the store control panel to edit the title, description, position at checkout, and availability. After registering your app, contact us and provide a payment URL where Ecwid will send POST request with order data as well as the Merchant app settings when customer is at checkout stage. Your app will need to get order details from the request, decrypt it and the information to a payment processor in a correct format, where customer can pay for that order. In a storefront, customer will see a new payment method to choose from. If they choose this new method to pay for their order, they will be directed to payment URL of your app to finish the checkout process. 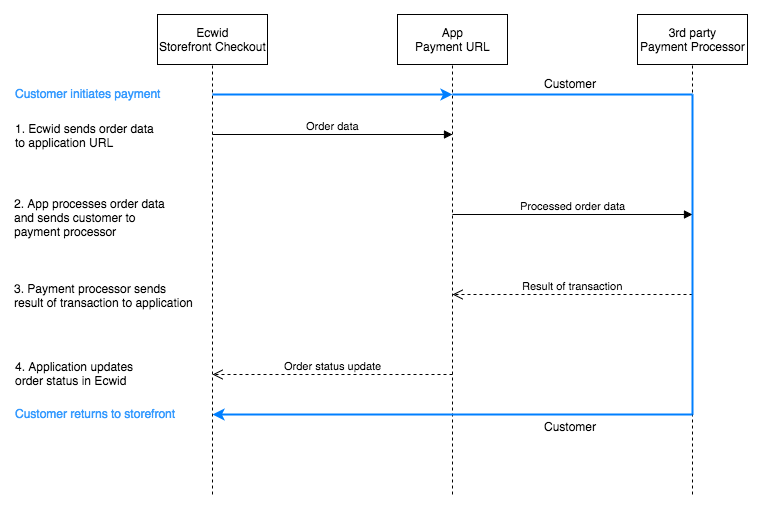 Upon finishing the payment, your app must update the order status and return customer to the storefront. Payment settings are located in Ecwid Control Panel > Settings > Payment. On that page merchants can edit existing payment methods and add new ones. If your payment application has been published in the Ecwid App Market and it’s publicly available, merchants can find it in: Add new payment methods > Other ways to get paid > Choose payment processor. Merchant will see your payment method in the drop down list depending on availability in their country. Make sure to specify the countries when submitting your app for review. The payment method name and logo will be used from your existing app settings. When a merchant clicks on your payment method from the available list, Ecwid will automatically install your application into that store. Then, the payment method of your application will appear in the list of added payment methods in the payment settings of that store. If your application works in the Ecwid Control Panel, Ecwid will open your app interface in a popup. If your application works externally, Ecwid will redirect merchant to a new tab to continue the set up. Merchants can search for your payment method in the Ecwid App Market. If your app is published and is publicly available, it will appear in the search results. Next, a merchant will click on your application and will be directed to your app details page. It will describe your integration in more details with screenshots. To add a payment method from app details page, merchants will click the ‘Install’ button and the installation will be the same as any other application from the Ecwid App Market. If your applicaiton works in the Ecwid Control Panel, user will be directed to your application tab and set up the connection. If your app works externally, the installation will continue on your website. As a result, a new payment method will appear among existing ones in the payment settings of merchant’s Ecwid Control Panel. The payment method added by your app works just like any other payment method added by a merchant. If you need to remove the payment method completely, go to: Ecwid Control Panel > Apps > My Apps and remove the app from the list.